Tuesday January 17th 1899 Weather colder and roads rough again. I ironed and was busy about the work most of the day. The boys got up more wood. Wednesday January 18th 1899 Will went to town today. he brought home a calf he bought up home. I was busy a great part of the day with the work. I did some mending. I was down in Callies a little while in the afternoon. 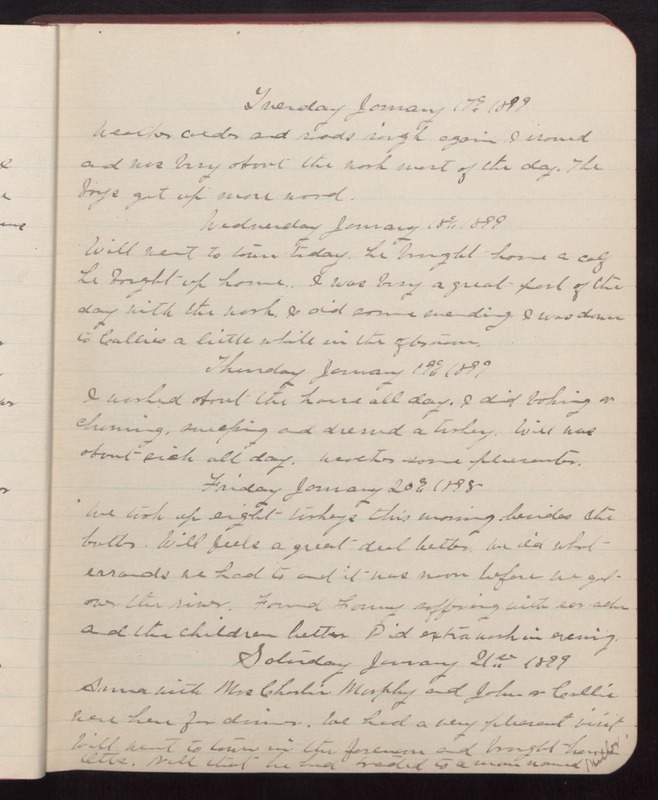 Thursday January 19th 1899 I worked about the house all day. I did baking & churning, sweeping and dressed a turkey. Will was about sick all day. Weather some pleasanter. Friday January 20th 1898 We took up eight turkey this morning besides the butter. Will feels a great deal better. We did what errands we had to and it was noon before we got over the river. Found Fanny suffering with ear ache and the children better. Did extra wash in evening. Saturday January 21st 1899 Anna with Mrs Charlie Murphy and John & Callie were here for dinner. We had a very pleasant visit Will went to town in the forenoon and brought home Otts. [Nell?] that he had traded to a man named Miller.